"Bluebell" as she was when operating the shuttle service on the first section of the Bluebell Railway's extension, in the mid 1980's. The P class fund was set up with the objective of returning locomotive No.323 to service after the expiry of its last boiler certificate. 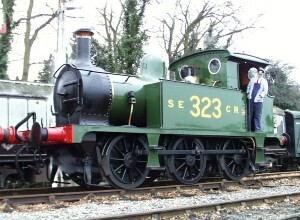 No.323 was built in 1910 at the Ashford works of the South Eastern and Chatham Railway for use on light passenger services, she was turned out in the full and rather elaborate passenger livery of the SE&CR. These small locomotives soon became victims of their own success and as a result had to be replaced on these duties by larger locomotives. The 8 locomotives of the class lived out the rest of their lives in the docks and yards of the Southern Railway and latter BR(S). The Bluebell Railway acquired their first locomotive, Terrier No.55 "Stepney", in May 1960 but required a second engine to start operating trains. BR was approached about the acquisition of a second Terrier, but none were available so they were offered No.31323. With some reluctance the P class was purchased, given her original number, 323, and the name "Bluebell". "Bluebell" entered service at the opening of the line in 1960 and proved that any concerns about the P class were unfounded; so much so that when a third locomotive was required in 1961 another P class was purchased, No.27. No.323 received her last overhaul in 1989 in time to operate the Northern Extension shuttles. Since then "Bluebell" gave good service on vintage trains, light shunting and footplate experience courses until being withdrawn for a 10-year overhaul in February 2000. As the now bigger and longer railway has less need for it smaller locos No.323 will not feature very high in the overhaul queue unless it can be funded from outside the main budget of the PLC, this is why the P class fund was set up. It is our aim to raise the money required to get this small loco back into service as soon as possible. The cost of the overhaul is expected to be in the region of £10,000-£15,000. A good start was made, but then priorities changed. 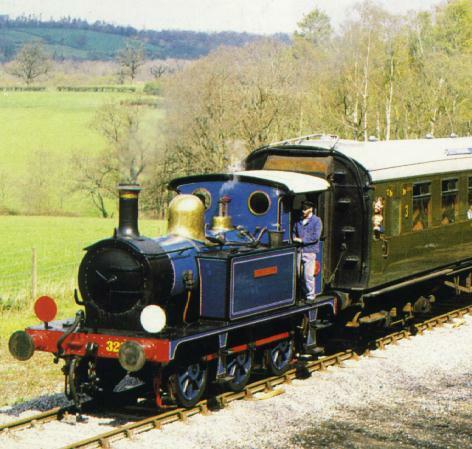 The P class fund has now raised over £3,000 towards the restoration of No.323 "Bluebell". This has meant that we have been able to purchase a new smoke box wrapper and front tube plate as part of a combined order with No.178. Tony Pearce has produced 4 screen savers featuring the railway. They are available on CD-ROM by sending a cheque for £5.00 (plus 60p P&P) to The P class fund at Sheffield Park. One screen saver can also be downloaded from this website. A postcard has also been produced featuring a photo of No.323 with the Metropolitan coaches by Peter Purdew and is selling well. Clive Groome of Footplate Days and Ways helped raise money last summer by running driver for a fiver sessions using "Baxter" before its withdrawal for overhaul. These courses helped raise a lot money for the fund and gave us a very good start. With the loco works having to concentrate on the overhaul of larger locomotives, the work on 323 has been sporadic, with the loco dismantled, and some overhaul work completed. However, whilst workshop effort is concentrated on other projects, the overhaul has been suspended temporarily. In 2009 it was decided as a priority to get the engine (as one of the two original locos which were used to re-open the line in 1960) running for the railway's 50th anniversary celebrations the following year. The Bluebell Railway Trust agreed to fund the work. So in September 2009 the loco entered the works and was lifted from its wheels, signifying the re-starting of its overhaul, with the aim of completing to overhaul for the 50th anniversary celebrations in August 2010. This was thwarted by the discovery of the need for additional boiler repairs, and after this additional work, the loco returned to service just in time to put in an appearance at the Branch Line weekend in March 2011. This page last updated 24 July 2006 (reformatted 13 November 2008, updated 11 March 2011) by Richard Salmon. Text Copyright © Neil Glaskin & Ruth Groome.